Crafty Baby was founded in 1998 by a love of sewing and a need for practical & durable children and baby products. Jill, owner and creator, discovered during her pregnancy with her first child that there was a lack of unique, yet classic, fabric crafted items for young children in her local stores. As a longtime seamstress and crafter, Jill decided to do something about this dilemma, and Crafty Baby was "born." Jill credits her attention to detail and quality to her Nana K who first inspired within her a love of sewing at the early age of 4. Jill's designs are one-of-a-kind and crafted specifically to ensure durability against washing and active little ones. Fabrics are carefully selected for the highest level of quality and comfort. 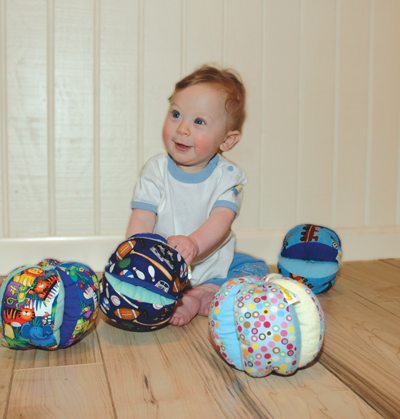 Crafty Baby has become a family affair, with Jill's children helping to pick out fabrics and field test products. Crafty Baby is a true, home-based, family company. We value our customers and are inspired by the children and families we meet and know.